To increase the power of your spells, and get even better results in less time, try combining them with these companion spells. Get Results Faster - Supercharge the power of your spells and get results faster when you combine your spells with this simple power ritual before or after your main spell casting. Get Better Results - Bless your magical spell casting equipment with this easy ritual to make sure it is pure and will not leak energy or deflect magic away from your wishes and intentions. Focused magic means better results. 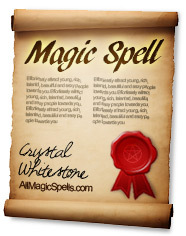 Protect Your Spells - Your spell castings may be attacked by evil spirits or dark witches. Defend and shield your spells against interference, black magic or evil demons with this anti-reversal protection ritual. I want you to be happy with your spells and ultimately successful with your magic so I've added some great bonuses which you will receive completely free when you order. 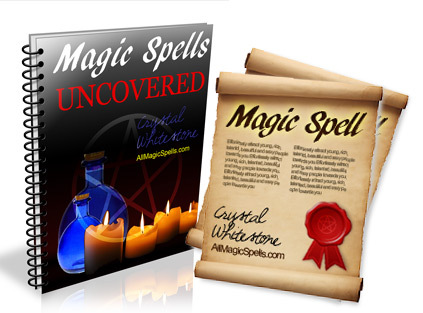 These are exclusive guidebooks and manuals to help you get the best out of your own magic power, and your new spells, based on many years of experience and research in the craft. This is the truth about magic and what it can do for you. Is it real? Is it safe? Does it really work? All your questions are answered inside this book. It also exposes common myths about magic, and reveals the truth about how magic works, and how you can make it work for you to achieve your wildest dreams. If you want to know what magic can do for you, you must have this book. This is your gateway to a world of unlimited power and success. You are different. Special. Powerful... and inside this book you will learn how to unlock the power inside you. Your magical equipment is anything you use during your spell casting. It is important that your equipment is protected so it can wield the full power of the universe during your magic. By blessing your equipment you will make it more powerful and effective, and it will become more magical over time as your power grows. 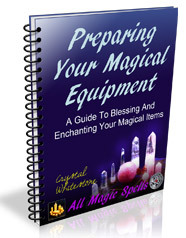 This book includes information about what to use during your spells for best results, and a simple ritual for empowering any items you have. Casting spells is very easy, but if you leave out key steps your results will not be as good as you'd hoped. Maybe you've tried magic before but felt disappointed or let down because "it didn't work". 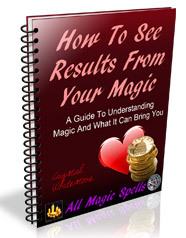 This book has all the secrets you need to acheive results with every single piece of magic you do. 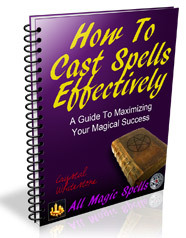 It is a step-by-step guide to proper spell casting and how to focus and channel your power for best results. Without these techniques you only have half the picture, and your spells cannot reach their full potential! If you want to do magic for fun, ignore this book. But if you want to do magic for REAL... the secrets are waiting for you inside. I'm sure you know the feeling. The warm rush of excitement as you get a new spell, the bubbling energy and power from within you as you cast it, and then gleeful anticipation of the results. After a day or two of nothing, you tell yourself it'll come soon, but you can't help feeling doubts. After a week, you're discouraged, and a month later when nothing has happened you're filled with disappointment. There are many reasons why spells fail, and if you don't know how to avoid them you will never achieve success. 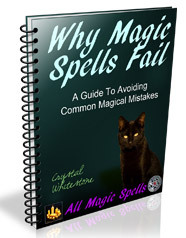 This book will help you avoid the top 10 most common magical mistakes. Without this book, you are doomed to a lifetime of accidentally sabotaging your own magic! Value: $24.95 - Yours FREE! Lastly, I have included this guide to seeing results from your magic. You see, magic is an artform, not a science. Results come in many shapes and sizes, depending on you, the spell you choose and the will of the universe. To avoid disappointment, you have to be open to results and accept them into your life. Welcome the results with open arms, and they will flood towards you. Many beginner witches cast spells and then somehow do not see results. It's not because their spells were unsuccessful - far from it! It's because they don't know where or how to look for the results. SEE the magic happening right before your eyes with the secrets inside this ancient manual. Watch miracles happen, and prepare to be astonished at your own power! These extra ebooks will complement your spells, improve your knowledge of the craft, and strengthen your skills so you can achieve the incredible results that you deserve. And they're all completely freely available on the download page after your payment. I've mentioned it before, but it's worth mentioning again. All my spells come with a 60 day money-back guarantee. If for any reason you are unsatisfied, you can have your money back (although very few have ever asked for their money back, so I'm confident you'll be pleased with your spells). Remember, many other sites charge as much as $50-$100 for one single poor quality spell. I guarantee my spells will be the best you've ever seen or your money back. This guarantee lasts for 60 days after your purchase. Something else. Something much... bigger. More powerful. More amazing. The REAL secrets of magic. These secrets will bring you love, luck, money, power, success and happiness for the rest of your life. This information is priceless. It has been passed down through generations over hundreds and thousands of years, whispered in dark corners and behind closed doors away from prying eyes. 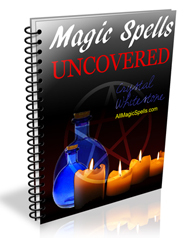 Talented and experienced witches have spent many lifetimes figuring out what works and what doesn't, and they've protected these secrets for centuries... but now you can uncover them and use them to get everything you've ever wanted. Today you're about to join an exclusive and elite society of people who are "on the inside", who hold the power of the universe in the palm of their hands, and who hold the key to their own destiny. Real magic is easy when you have the right spells, and the real secrets. That's why you're here today. Call it fate, call it coincidence. I prefer to call it "magic". You're here for a reason. And that reason is to change your life for the better. There is nothing stopping you. Take a leap of faith, and don't let this opportunity pass you by! Spells start at $15.95, but get cheaper every time you add more to your basket. "It really did work! It was like I was really protected. It helped a lot, thanks so much. I'll be using it a lot now!" "The spell was easy to do and I felt an energy burst while I was doing it. Thanx!" "The incantation worked, I felt the power when saying it. The worries I had didn't seem so terrible as they did before. Thank you very much!" "I bought the get ex-back bundle. It was wonderful, fully detailed, letting me know just what to do, and when. I cast it the other day and I've already seen some great results from it. I would absolutely recommend it." "Your spells are simple and easy to understand and I thank you very much." "I saw results almost immediately after the spell was completed and I have to say this was a great spell. I would definitely recommend it to others! I hope all of the others work as brilliantly as this one." "The spell has worked wonderfully. I feel a lot better as if all my troubles are swept away. THANKS!" 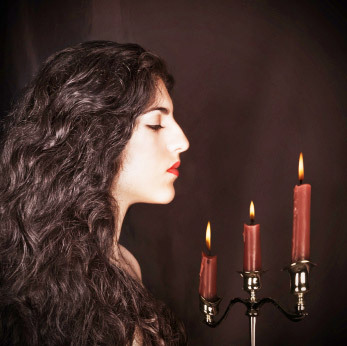 "2 days after casting the spell I heard from my ex and since then he has called me much more (there was no contact at all before the spell casting). As you can imagine I'm chuffed to bits!" "Since I cast the money spell you gave me I have money that is enough for me and my family." "The spell was very easy to cast and I liked it very much! I felt the magick and it was very effective. Other protection/angel spells I've tried before weren't as powerful, didn't last long or didn't work at all. However your spell lasted a very long time and it was very powerful. Thanks!" "I tried your spells the same day I got them and was astounded by the results they gave! I tried the guardian angel spell and the very next day I had was the best day I had this year!!! thank you so much for your spells they really DO work and they give amazing results. Thank you for the spells they are amazing!" "Your spells are beautifully written, and i love how you explain exactly what to do ... I'd also like to tell you the e-books that came with it were so helpful and full of great advice and information." "I just had to write to you and thank you for the spell I bought yesterday. The first time I performed a spell was about 12 years ago and I never got the kind of success I dreamed of. I cast the spell at midnight last night - and I just got an email with a job offer, doing a job I have always dreamed of! You just saved me from spending hundreds of dollars to pay a spell caster to help me. I really appreciate it." "I very much enjoyed the spells. They were effective and simple to use. I was glad that I didn't have to go out and find a ton of items to use these spells. I tried all the Spells I have received and they were good quality." "I loved both of the spells and they work wonderfully." "Hi, This is Steianta again. The magic fertility spell worked im now 7 weeks pregnant. Thank you sooooo much!" "These spells are alot more in-depth than any other spell i've seen so thanks"
"Your spells worked very nicely, astonishing compared to other web sites. The breakup spell you sent me really cleared my head, and now I can focus on getting back to a rational state of mind. The Guardian Angel spell saved me - I almost got hit by a car but was tugged to one side by an external force. A thousand "thank yous" to you." "Thank you your spells are very good and they are exellent compared to other spells"
"My wife was very distraught with our relationship, the spell did meet all expectations. It was quick and easy and results were basically overnight! Would highly recommend this spell. Thanks"
"Hi Crystal. I have wanted a certain job since I returned to East Coast after living in California. I used the "Promotion Spell" on Monday, and on Tuesday I received a call telling me I had been selected for the position I had wanted. Thanks Crystal." "I absolutely LOVE these spells. They actually DO work! I hope that everyone else is getting as good results as I am!!" "I did like them. I got the results I wanted. And so far, these have been the most effective spells I've tried." "I would like to say thank you so much for the spells :) I tried one spell and it was amazing, i felt really energised and at peace. The energy around me was beautiful and i just loved it so thank you." "I have tried the spells and they absolutely worked. The break up spell toatally worked, it cleared up all the bad fealings of him. The guardian angel spell worked well too, nothing bad happend since I used it." "I used to have bad luck a lot. Then I found this website and I bought the Gaurdian Angel Spell. My life has been turned around completely and now every day is a good one. Thank you! Thank you! Thank you! You have changed my life! I am really grateful. This is the best website I have ever found. I would reccomend it to anyone I know. The spells really work and they have changed my life. Thank you Crystal!" Will you be the next person to experience the power of real magic? All the comments above are from real people who have used my spells. Some people received a free spell in exchange for their comments. Some of the comments have been edited for clarity and brevity. Magic is a very personal experience and everybody experiences magic differently, so your results may vary. All payments are safe and secure. You may pay by credit card or PayPal. Clickbank processes your payment. Your payment details are not stored and will not be shared with anyone.